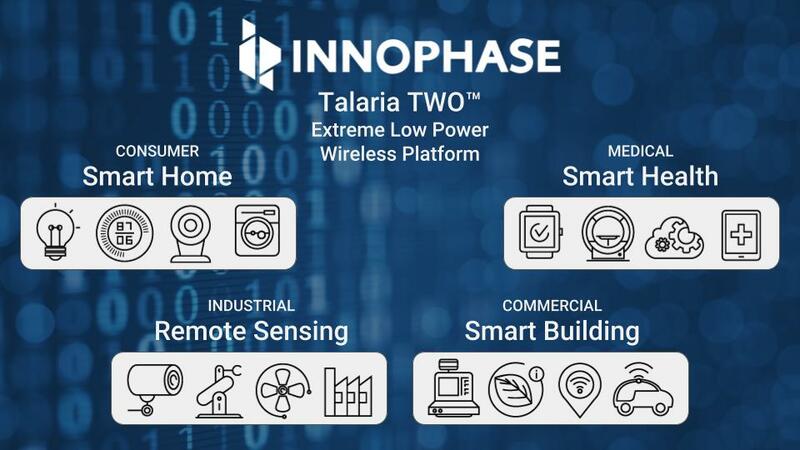 InnoPhase, a new fabless semiconductor company specializing in extreme low power wireless solutions, announces the Talaria TWO platform, a complete wireless IoT solution integrated on a single chip. It contains a full functionality multiprotocol transceiver, MAC/PHY, digital power amplifier and an embedded ARM processor for lightweight applications. The Talaria TWO chip is designed for battery-based IoT applications and is optimized to be the lowest power Wi-Fi solution in the industry. It has the potential to create a whole new class of IoT products that can cut the power cord and be battery-based with a DTIM3 specification at least half that of leading low-power Wi-Fi solutions. The Talaria TWO platform uses InnoPhase’s revolutionary patented PolaRFusion™ radio architecture, which processes radio signals using polar coordinates rather than traditional IQ coordinates. This digitally-intensive radio solution dramatically reduces the amount of power required to transmit, process, and receive wireless information using industry standard wireless protocols. It achieves this by moving most of the radio signal processing from power-hungry analog circuits, found in today’s IQ-architecture wireless solutions, into power and size efficient digital logic. The product provides maximum flexibility by actively managing multiprotocol coexistence for 802.11b/g/n and BLE 5.0 for demanding edge-of-network applications. Initial customer products developed using the Talaria TWO wireless platform have shown battery life improvements of more than 50% versus competitive solutions. Products will now be able to go weeks, months or even years longer between battery charging or replacement. If you are attending Embedded World in Nuremberg, Germany, February 26-28, 2019 and would like to schedule a product demonstration, please contact sales(at)innophaseinc.com. Key customers are now sampling the extreme low power Talaria TWO wireless platform with full commercial availability and certification slated for mid-2019. For additional information about the platform and the innovative PolaRFusion radio architecture visit innophaseinc.com/technology. InnoPhase is a fabless wireless semiconductor platform company specializing in extreme low power wireless IoT solutions. The company is headquartered in San Diego, California with an additional development center in Kista, Sweden. The company has created the industry’s first complete polar radio architecture that is being used to develop a wide range of innovative wireless platforms for the rapidly growing battery-based IoT market. For more information on InnoPhase visit innophaseinc.com.